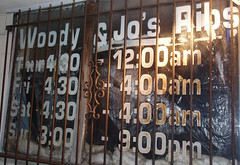 I do not recall when I started going to Woody and Jo’s Ribs. I can recollect that it was always late at night and I was always alone. My guess is I started going in the mid 1990’s. It seems a little bit dangerous at this corner spot late at night. 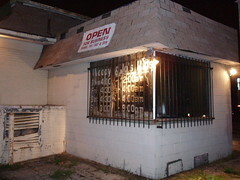 The place looks like it is closed or condemned or abandoned. However, there is a true charm to the place and it always feels like an adventure or misadventure getting ready to happen when I drop in. The hours are unique, much like the customers this cinder block bunker hut serves. As you transition from the outside to the inside some subtle things are noticable – iron bars on the windows, some possible bullet holes and a constant chatter in the kitchen area. Cracked plexiglass shields Woody or Jo or another family member from the customers or it is shielding us from the aroma of BBQ. There is a thin slit for sliding money one way and food back the other way. Please note no $50 or $100 bills are accepted. I am sure there are many reasons for that choice. Some quick scribbling occurs on a ticket, an order is yelled back (about 5 feet) and a calculator comes out to add up the total. This is a cash business – no credit cards, no checks, and no bartering….I have a feeling Woody has something behind the counter in case the customers get a little restless. 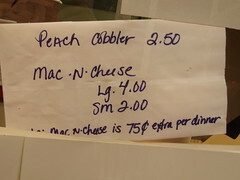 The menu has remained the same for a long time – some new additions have popped up and are written on a paper bag – Peach Cobbler and Mac and Cheese. You can usually expect your order in 3-5 minutes. Bread comes with some of the choices – two pieces of Wonderesque white bread in a plastic sandwich bag. 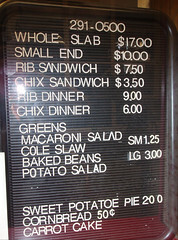 Actually – this bread is for the “sandwich” – the rib sandwich is a cut of ribs with the bagged bread slices. The chicken sandwich is 1-2 pieces of chicken (white or dark meat) in the same format. So you do not really eat the sandwich as a sandwich, you use the bread to sop up the sauce from the foil and the bones. All of the meat comes wrapped in generous amounts of aluminum foil. I have tried all of the sides. The best bets are greens (plenty of natural fat in these) and baked beans. One tip on the greens, if you don’t eat all of them just pitch the container, you do not want to see what the greens look like after a night in the refrigerator. This is an experience. This is the type of place that you drive by and wonder..what is it like in there. So now you know. This entry was posted on November 11, 2007 at 3:28 PM	and is filed under CLOSED, culinary misadventure, sandwiches. Tagged: Woody and jos. You can follow any responses to this entry through the RSS 2.0 feed. You can leave a response, or trackback from your own site. I’ve driven by that place. Tempting, but scary. I wonder what kind of health inspection they get. These are the absolute best greens in Columbus. 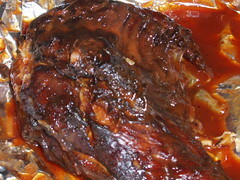 The Ribs are always fall-off-the-bone tender and the sauce is delicious. Woody and joe’s is one of the few spots in town I find myself craving from time to time. My first house was a block away on Hamlet in the early 90s and we LOVED W&J’s. I remember back in the nineties when I lived in Columbus years ago. A friend told me about the place and I must admit, the best ribs I have ever had. Greens off the chain.